But Narco Karabakh’s murky origins and unlikely claims make it appear more of a black PR stunt. The cover of a new book/black PR effort published under mysterious circumstances. 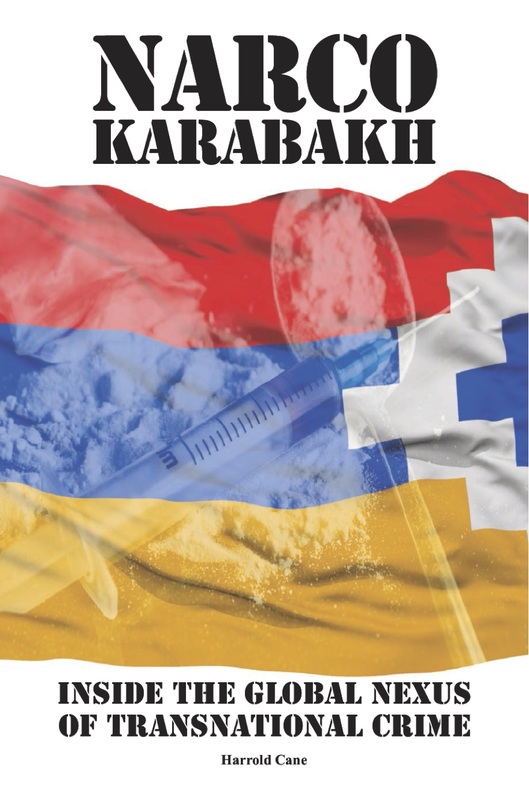 A new book claims to expose Nagorno-Karabakh as an international hub of drug, arms, and human smuggling. But the book’s murky origins and hard-to-support allegations suggest instead an elaborate effort to spread black PR in the international media against Karabakh and the Armenian forces who control it. As evidence, the book cites a number of foreign government, NGO, and journalists’ reports, though those often don’t back up what the book claims that they do. Those sources are supplemented by the author’s own, frequently dubious, observations. In one chapter, the author claims to have stumbled upon a member of Stepanakert’s de facto parliament patronizing an open prostitution market. The book’s origins are mysterious, and a number of elements raise suspicion. The author operates under a pseudonym, Harrold Cane, “amid safety fears.” Cane claims to have spent 18 months researching the book, including trips to Madrid, Moscow, Doha, Beirut, Paris, Washington, Sofia, Baku, Istanbul, Kabul and Tbilisi as well as multiple visits to Yerevan and Stepanakert. But it’s not clear who funded such extensive research and travel; the book is offered as a free download from a well designed website. (According to the website, hard copies will be offered for sale in February.) The website registration information is hidden. The book is aimed at an international audience and its Twitter account regularly tags foreign media and organizations, including CNN, Foreign Policy, the BBC, Human Rights Watch. Thus far, though, that outreach seems to have borne no fruit and the only press the book and its claims has gotten has been in pro-government Azerbaijani media. Curiously, the first follower of the Narco Karabakh twitter account was Tural Ganjaliyev, the newly appointed head of Azerbaijan’s government body representing Azerbaijanis displaced from Karabakh. Ganjaliyev also has “liked” a number of tweets from the account. He did not respond to a query from Eurasianet about the book. Joshua Kucera is the Turkey/Caucasus editor at Eurasianet, and author of The Bug Pit. Sign up for Eurasianet's free weekly newsletter.